40% of Birmingham is classified as a food desert. To address this problem, we propose a web application, Grocery Bus, an inventory tracking web application for rolling grocery stores. List locations of 6 corner stores. 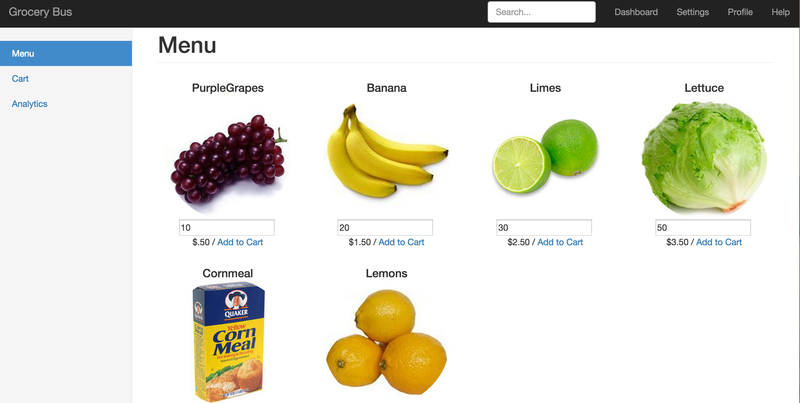 Design customer identification / profile system for buying groceries with "rewards points." The end-user for our solution is a customer visiting the bus or corner store. A survey that gathers information about shoppers. (Use Survey Monkey). Online survey (from home)A way for consumers to view inventory from home at each of the corner stores. A way for consumers to buy an "entire" meal and it places them in the shopping cart. A follow-up email after each purchase with some metrics and suggestions. Nutritional information about food items on the bus. Track "healthiness" of community based on data collected from consumer purchases - some kind of map visualization, pie chart, etc.